Music is a feeling. A vibe. Closer to an emotion than linked to a physical, tangible thing. It’s something you feel in your heart, your head and, sometimes, in your hips. In your soul. But it’s still a real live thing, right? It’s made. And petroleum-based products play a role in music from instruments to recording gear, fueling anything from beat-up garage band vans to world-tour private jets. And, of course, if you want to transport those soul-shaking notes directly to your ears, there’s one petroleum-based product that’s been doing it better than any other for more than 70 years: the vinyl phonograph record. Let’s start with a little quick primer on how a record is born. It starts with something we’ll call “record seeds.” These are grains of petroleum-based plastic in a variety of colors that are poured into a hopper. They’re heated to about 300-degrees and extruded into a “biscuit.” The biscuit is then popped into a mold with a recording master plate on each side – that’s an electroplated mold of the reverse of the record grooves... you know, for pressing. Because there, it’s hydraulically pressed into a flat disc with the grooves going the right way. The disc is put onto a trimmer to take off the excess vinyl, then chills for about a day or so. And pow, you have a record. A record starts with grains of petroleum-based plastic that are heated to about 300-degrees and extruded into a “biscuit." Simple, right? In theory, yes. But when you take into consideration the machinery (which isn’t really being mass manufactured anymore and is somewhat hard to find), the manpower (people trained to know how to make all of it happen), the workspace (these are large pieces of hydraulically powered equipment here), the packaging, the shipping – It’s not the easy way, for sure, considering that the below-average high school kid could upload a fairly high-quality sharable MP3 to the web for all the world to hear. So the real question is: why? Why take the long way around? Why take the harder, more expensive, more time-intensive path? Because, love. According to Third Man Pressing in Detroit, that’s exactly why. One of the first newly built record presses in about 35 years. Third Man Pressing has eight of them. Right now, there are about 50 record-pressing facilities in the world. 18 or so are in the United States. In Detroit, a city known for music, among other things, a new plant just opened. In fact, it’s the first new pressing plant to open in the city in pretty close to a generation and the very first artist-owned plant in the world. It’s called Third Man Pressing, a new venture from Grammy Award-winning artist and all-around music rule script-flipper, Jack White, and his label, Third Man Records. 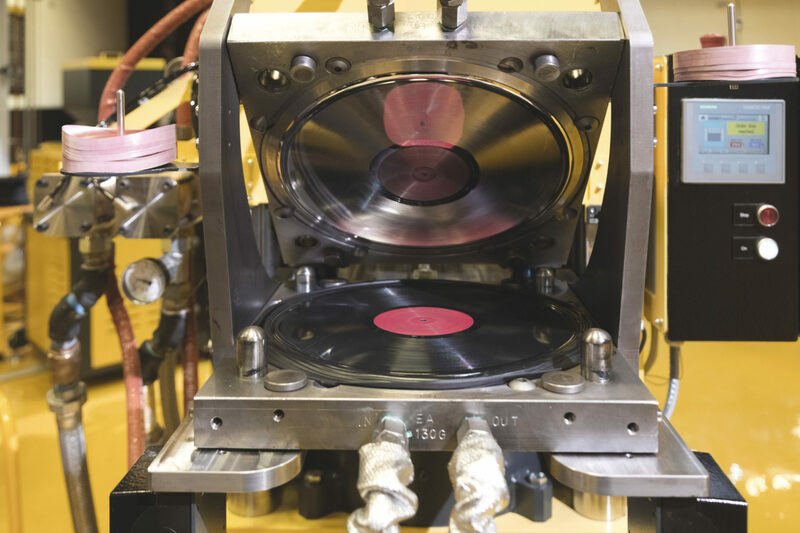 The idea to build a new record-pressing plant originally started as an effort to re-press out-of-print White Stripes’ records, but turned into more of a labor of love. An endeavor that fosters a new independent underground. An artist-controlled, anti-rulebook, beautifully curated punk-rock investment in music and culture. The 10,000 square-foot facility is the first fully climate-controlled pressing-plant work environment in the world. As the self-appointed “Psychedelic Stooge” of Third Man Records, Ben oversees vinyl manufacturing and distribution. He has an acute sense of what it takes to make a record from beginning to end, so when the label first decided to make this idea a reality about a year and a half ago, he knew it was going to be a monumental effort. Finding the machines, finding the staff to operate them ­– it was certainly the biggest leap into DIY that Third Man Records had ever made since starting the label in 2001 and building the flagship brick-and-mortar in Detroit in 2015. But they decided to put their money where their mouth is and jump. We do it because this is important and compelling to us. So they started looking for record-pressing equipment. Went on a quest for lightly used gear in all the four corners of the world. Poked around for potentially reliable beaters that they could fix up. Because here’s the thing: new machines haven’t been built for about 35 years... Well, that is until they found a manufacturer in Germany who just recently built a handful. Third Man decided to pony up the investment to purchase eight of these environmentally efficient machines and have them shipped to Detroit. Brand-spanking-new extruders and presses that they customized in the immediately recognizable colors of the brand. That move alone was starting to stink of history in the making, but they found no reason to stop there. Third Man Pressing throws record manufacturing right in your face. Rather than having a closed-door plant in the back of some building, they built an enormous glass wall on the back of the storefront. They curated and designed every inch of the 10,000-square-foot space to represent a visible Third Man ethos: yellow-black-and-white design cues; an enormous hand-painted mural from famed artist, Robert Sestock; huge red-and-white-striped support pillars that represent the White Stripes’ foundation that Third Man was built on. This is not only the first fully climate-controlled pressing-plant work environment in the world – it’s a place where record enthusiasts can see it happen right in front of them. Not as some spectacle sideshow, but operated by trained professionals who care about music more than anything. Third Man Pressing puts the process on display from inside their flagship store in Detroit. They live by the philosophy that money should never be the primary concern in what they do. If that were the case, they could crank out digital files by the boatload and go to bed early. But doing it right, crafting the process, making it the right extension of the brand is important. “There’s beauty in the struggle. In the connection. In the love,” according to Blackwell. Since the grand opening in the end of February, Third Man is now pressing somewhere around 5,000 records in an eight-hour shift. Each record takes about 45 seconds from seed to platter and their sixteen or so employees do every bit of it by hand – from pressing to inspecting to giving them a test play on the factory floor sound system. They’re capable of pressing both full-size 12-inch records and 7-inches in 130g or 180g vinyl and in 19 crazy colors, from basic black to pink fluorescent and every odd combo you can think of. They archive the plates in a massive, mostly-empty-for-now-but-filling-up bookshelf. And they’re taking orders from labels and musicians, large and small, all over the world. But with a goal that focuses on “what’s next?” – there’s no end to where Third Man will take things. Whether that means pressing larger volumes, using different materials, experimenting with even more insane color combinations or concocting something that hasn’t even been invented yet, Third Man Pressing seeks to keep their version of the record industry loud and living up to its name: a fiercely independent industry that both makes and shatters records.